The following General Terms and Conditions (GTC) apply to all orders placed through our online shop by consumers and traders (customers). The customer's contractual partner PrintCarrier.com GmbH , 90762 Fürth, Germany. If the trader uses conflicting or supplementary General Terms and Conditions, their validity is herewith controverted. They will become part of the contract only if we have expressly agreed to it. By listing the products in the online shop, we make a binding offer to conclude a contract concerning these articles. You can first place a product in the shopping cart without obligation and check and correct your entries any time before submitting your binding order. The contract is formed when you have read and accepted our General Terms and Conditions and our Instruction on Cancellation and when you accept the offer by clicking the “Order liable to pay” button. There is no minimum order value. You can transfer your print data to us in various ways: Clicking the “upload files” button right after having placed your order opens our Data upload via which you can send your completed print data to us. You can also upload your artwork files later in the order overview of your customer account. By clicking the “Finish” button you release the data for printing and we prepare your print data for productionUnless otherwise specified below, changing the print data of the order after having released the data for printing is not possible. Another chargeable additional option is a file verification. Within the scope of this file verification we check your print data with regard to resolution and bleed. Checking page orientation, spacing of important elements, OPI information, font embedding, PDF standard, colour mode and sharpness of text, images and graphics are only available in the paid versions. We do not check the print data for spelling and typographical errors, colour reproduction or adherence to the maximum colour application of 300 %. We do not check the overprint settings and positioning of folds and perforation lines because they may be pertinent to design considerations. Please note that we do not assume any liability for circumstances outside the scope of our file verification. To exercise the right to cancel, you must inform us (PrintCarrier.com GmbH , Dr. Mack-Straße 88, 90762 Fürth, Germany, info.uk@PrintCarrier.com, telefon: 033 0808 5587, fax: (+) 49 911 521915 99) of your decision to cancel this contract by a clear statement (e.g. a letter sent by post, fax or e-mail). You may use the attached model cancellation form, but it is not obligatory. You shall send back the goods or hand them over to us, without undue delay and in any event not later than 14 days from the day on which you communicate your cancellation from this contract to us. The deadline is met if you send back the goods before the period of 14 days has expired. You will have to bear the direct cost of returning the goods. We only deliver by way of shipping; collection by the customer is not possible. We deliver to the entry of the building at the stated delivery address. Information on the delivery area is available in our online shop at Shipping > Questions about delivery. Within Germany, standard shipping is free. If we have to send the goods once again to you, for reasons you as the customer are responsible for, you will bear the costs incurred for that. The same applies if the delivery address is changed at your request after formation of the contract and this leads to higher shipping costs or causes additional costs (e.g., if the change is made after shipping of the goods). 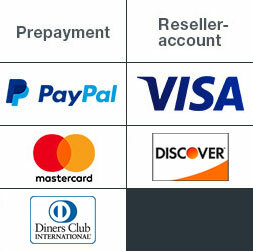 The payment options indicated at the time of order placement apply. There is no claim to a specific payment option. All the information and fees are available in our online shop at Shipping > Payment methods. We send the invoice to you after shipping of the goods, in electronic form as PDF file format to the e-mail address stated at the time of order placement. We do not issue any paper invoices. Until complete payment, the goods remain our property. The following applies additionally to traders: We reserve the title to the goods until complete payment of all debts from an ongoing business relationship. You may resell the reserved goods in the ordinary course of business; you assign to us in advance any claims resulting from this resale – regardless of a combination or mixing of the reserved goods with a new item – in the amount of the invoice and we accept this assignment. You remain entitled to recover the debts; however, we may recover debts ourselves if you do not fulfil your payment obligations. You are obliged to give us the necessary time and opportunity required for the remedy that we owe you, in particular you need to hand over the complained item to us for examination purposes. The statutory limitation period for claims for defects by traders is one year as of delivery of the goods. If, within the scope of the order, we render creative services, the resulting works (sketches, drafts, primary products, printed products, etc.) are protected by copyright. We grant you the simple, non-exclusive right, unlimited in time, to use them to the contractually agreed extent and for the contractually agreed purpose. You may use the protected works to design own print templates, provided that printing will be done by us. Further rights of use, in particular the right of reproduction, distribution, making available to the public, the broadcasting right and the right of reproduction through image carriers and sound storage media, require a separate written agreement if not included in the contractually agreed purpose. The detailed data protection statement is available in our online shop at Privacy Statement. All information on these codes of conduct is available in our online shop at About us > Our Certification Commitment.